"From The First Time" was recorded at SounDog Studios in Richmond, Virginia in 2010. All music and lyrics are by Dave Shiflett (ASCAP). The disc is produced by Alexandra Spalding, who also plays cello and sings harmony vocals. Adrian Olsen is sound engineer and plays drums, pump organ, electric bass and piano. Matt Boon plays acoustic bass on “Let’s Go Walking Around” and “Fatal Green.” Skip Andrews plays acoustic bass on “Turn Your Heart” and “Old Country Town.” Tripp Johnson plays mandolin. Kimberly Borchard plays banjo on “Old Country Town.” Dave Shiflett plays guitar and sings. Dave Shiflett is a writer -- contributor to Bloomberg News, The Wall Street Journal, The Washington Post and other publications -- and author of several books, including one with Donald Trump ("The America We Deserve"). 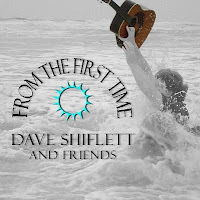 He also writes and performs music and has released four CDs -- "Time Goes Rushing By" (Floor Creak); "Songs for Aging Cynics" (The Karma Farmers); "Afternoon Lamentations" (Dave Shiflett and Friends) and "From the First Time" (Dave Shiflett and Friends).